Directions: Things may seem a little bewildering due to the city's patchwork-method of road expansion and adding of flyovers and interchanges ad hoc. Tune Hotel Danga Bay is at the (currently) uprooted junction where Jalan Tun Abdul Razak and Jalan Skudai merge. Info / Insights: Danga Bay is part of the Flagship A parcel, one of five flagship zones in the exciting Iskandar Malaysia project of Johor. Armed with a rather ambitious moniker, the "Vision City of the South", Danga Bay is an integrated waterfront development that covers some 450 acres of land area. 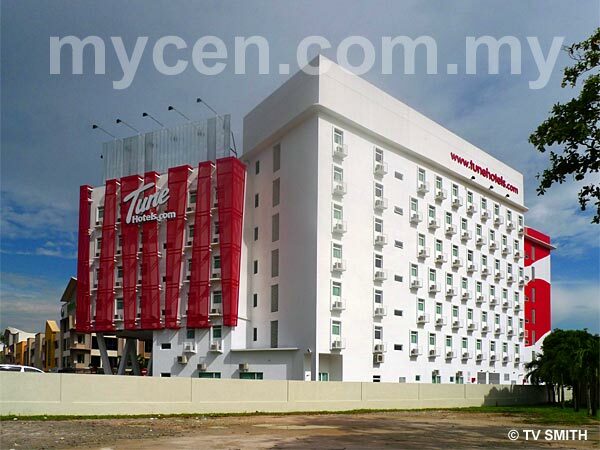 The 218 rooms Tune Danga Bay is the largest in the Tune budget hotel-chain, occupying its own purpose-built building. As such, you will find a secure car park enclosed by a perimeter fence (wall). There is an ATM, a 7-Eleven and a cafe in the building. There are also several PC terminals for free surfing at the lobby. Hotel guests can board a convenient shuttle bus (operated by Odyssey) to Resorts World & Universal Studios in Sentosa Island, Singapore. Another coach (operated by Compass) ply the new Marina Bay Sands Hotel route. Both trips may take up to an hour and half, depending on queues at the customs and immigration checkpoints. The wi-fi enabled buses usually enter Singapore through the Causeway and return via the Second Link. From the basement of the city casino hotel, passengers can then hop on a free shuttle bus (service provided by Marina Bay Sands) to Orchard Road and Suntec City. You should pre-purchase the bus tickets together with the hotel accommodation if you wish to pay by credit card. A two-way (return) ticket costs a very reasonable RM 25 (per adult and RM10 per child below 12 years of age). The bus companies have a ticketing office in the building and the coaches depart from Tune's doorsteps several times a day. Try not to miss the last bus home. Getting back from Singapore after 11 pm by other means may negate all your savings obtained from the low room rates.